Among the major health transitions witnessed in the second half of the twentieth century, the most globally pervasive change has been the rising burden of Non communicable diseases (NCDs). The term NCD’s include cardiovascular diseases, diabetes, cancers, chronic respiratory diseases, injuries and mental disorder. According to the WHO, NCDs are going to be a major challenge as they would account for 67% of total deaths by 2030. The main reasons for NCDs are high usage of tobacco, alcohol, unhealthy diet, physical inactivity, stress, insufficient treatment and general lack of awareness among Indians. Despite NCDs being a major cause of morbidity and mortality in India, there are currently very few programmes addressing NCDs. Thus, there is a critical need for forging effective multi-sectoral partnerships for NCD prevention. 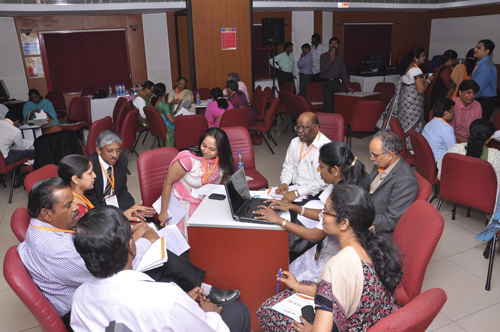 The Madras Diabetes Research Foundation (MDRF) in partnership with Public Health Foundation of India (PHFI) along with the Centre for Chronic Disease Control (CCDC), Health Related Information Dissemination Amongst Youth (HRIDAY) and supported by the World Health Organization (WHO) undertook an assessment of existing NCD related health promotion initiatives in India to identify the potential gaps, barriers and opportunities for promoting multi-sectoral participation in NCD prevention. 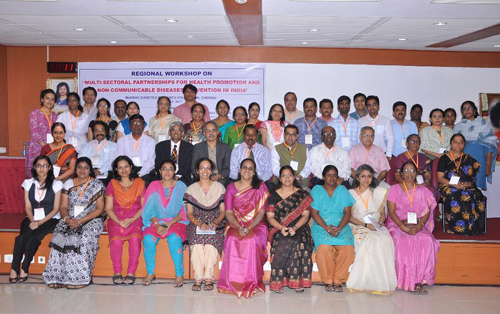 Towards that, a one day regional workshop was organized on 23rd July 2011 at MDRF, Gopalapuram, Chennai. 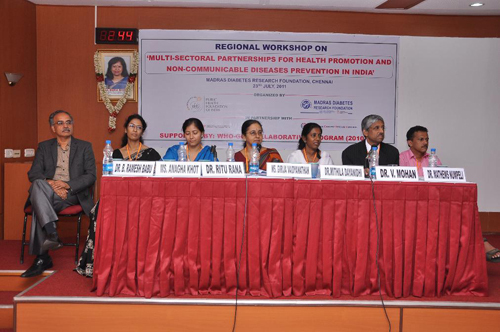 The aim of this workshop was to sensitize various stakeholders on NCD burden in the country and obtaining their inputs on how multi- sectoral partnerships can be achieved to alleviate the rising burden of NCDs in India. capacity building efforts and resources are needed to comprehensively tackle NCDs in India. Dr.S.Elango, Former Director, Public Health and Preventive Medicine, Government of Tamilnadu was the Chief Guest for the valedictory function and the function was presided by Hon’ble Shri T.M.Jacob, Minister for Food and Civil Supplies, Consumer Affairs & Registration, Government of Kerala. Ms.Girija Vaidyanathan IAS, Principle Secretary to Government of Tamilnadu for Health and Family Welfare Department. Dr.Ritu Rana National Consultant NCDs, Ministry of Health and Family Welfare, New Delhi and Ms. Anagha Khot, National Professional Officer - Health Systems and Human Resources World Health Organization, New Delhi were the guests who attended the valedictory function. 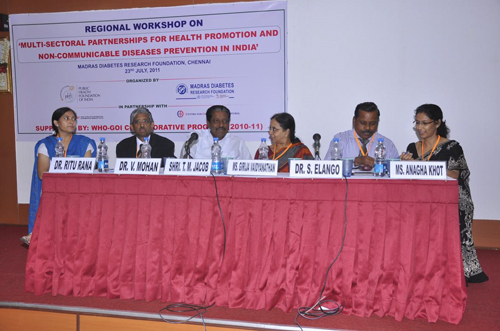 This workshop served as a platform to recommend appropriate strategies for inter-sectoral collaboration for NCD related health promotion and on the possibilities for integrating it into other health and non-health sectors in their respective regions.